A prominent member of the African Union's (AU) Commission of Inquiry on South Sudan has expressed confidence that the group will come up with recommendations to resolve the crisis in the world's newest nation following meetings with President Salva Kiir and former vice president Riek Machar. The AU commission, led by Nigeria's former President Olusegun Obasanjo is mandated to investigate and come up with solutions to assure justice, accountability, reconciliation and ensure the crisis never happens again. A leading member of the AU commission, Justice Sophia A. B. Akuffo, who is also president of the African Court on Human and Peoples' Rights, says the group wants to ascertain the underlying causes of the conflict, which has left at least ten thousand people dead and hundreds of thousands displaced from their homes. "We have already done one exploratory visit to South Sudan so we can observe firsthand what the situation is. We met with the president and even with the former vice president," said Akuffo. The commission, Akuffo says, met with the Council of Churches, African diplomats, international agencies and also visited an internally displaced camp, to gauge the current situation on the ground. "This is just to begin to understand that underlying causes of all these because situations like these don't just arise by themselves, there is always causation," said Akuffo. The AU has openly expressed support to the mediation efforts by the Intergovernmental Authority on Development (IGAD) a regional bloc mediating the peace talks between representatives of the government in Juba and rebels allied to former vice president Machar. But, some critics say the African Union has been too slow to help end the conflict in spite of the crisis that has devastated the country. Akuffo rejects the criticism and says the AU has been engaged in the process to find peace in South Sudan. 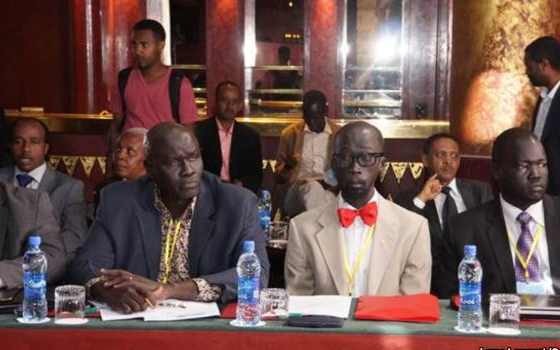 "The African Union [officials has] been fervently supporting the work of IGAD, and it is just unfortunate that sometimes when you are seeking peace through mediation sometimes things might blow up," said Akuffo. She declined to give details about the commission's meetings with both Mr. Kiir and Machar. "Both expressed themselves willing to cooperate with the commission, and were willing to give us their side of what the root causes of the problem are as they see it," said Akuffo. She also says the AU's commission of inquiry on South Sudan will come with a measure that will ensure that the country does not revert to a nationwide violence again. "I think the prospects are really bright," said Akuffo. "We will be able to come up with very fruitful and useful and effective outcomes that not only will stop the current crisis, but will help the people to begin to resolve those underlying problems."